The first migrant Baird’s Sandpipers usually appear in southern Ontario during the last few days of July / early August. Here are a few comments on what to look for with Baird’s (far from a definitive list). Habitat: often found in slightly drier sites, such as the outskirts of mud flats, field sites, sod farms, etc. Behavior: A relatively dainty forager, less likely to aggressively probe the mud, preferring to lightly pick away at substrate. 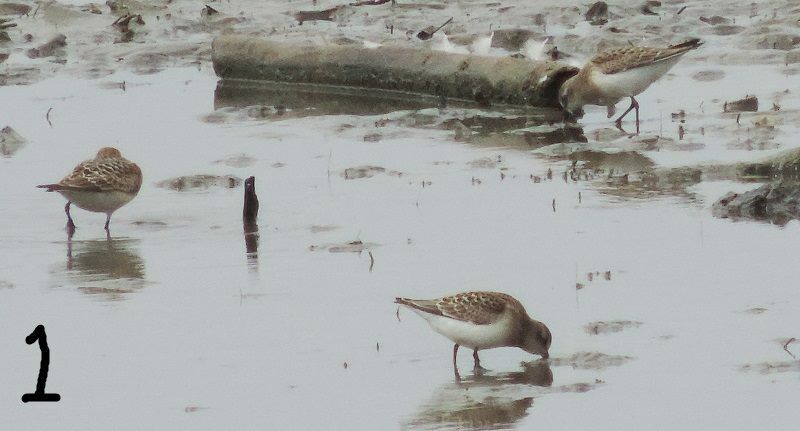 Figure 1: Note here that the Baird’s, which is larger than the adjacent Semipalmated Sandpipers, appears similar-sized, even smaller in comparison, from this angle. However, its broad back, oval GISS, evenly horizontal feeding posture, and crisscrossed primaries warrant further investigating. Figure 2: From this angle, compared to the Semipalmated Sandpiper at right, note: the larger size overall, longer and thinner bill, and long primaries which are held at a crisscross (open scissor) orientation. Figure 3: At this angle, the long, lean build with an elegant, attenuated rear is quite apparent with Baird’s (center) as is its larger size compared to the adjacent Semipalmated Sandpipers. Cox, C. 2008. Identification of North American peeps: a different approach to an old problem. Birding 40(4): 32-40.